Where can I get the script for my local play? Where were folk plays performed? At what season were folk plays performed? How does the Licensing Act affect mummers? How are folk plays staged? How are mumming plays directed? How are folk plays performed? How do folk plays start? How can the main action be acted? How do folk plays finish? The questions on this page are based on real questions that I received during my time as a folk play webmaster - unlike many websites, who make up the questions they feel should be asked. In answering them, I have tried to represent the consensus of academic opinion, while also covering the range of opinions among practitioners. Incidentally, these answers only relate to British and Irish folk drama. Folk drama customs in other countries are often very different, and require separate answers. It is sometimes said that every village used to have its own play, but this overstates things. This might have been true in a few districts, although often one group covered a number of neighbouring villages during their performing season. However, as can be seen even in the thumbnail map on the right, there are large areas where no plays have been found, despite assiduous searching by folklorists. In summary, plays were performed in most of England, except for East Anglia and parts of the south east, the south west, the Welsh Marches and the northern Pennines. There were a few plays on the south coast of Wales, but not elsewhere, presumably for language reasons. In Scotland, there were plays in the central lowlands and parts of the southern uplands, but not in the Highlands and Islands. In Ireland, the plays were found throughout Ulster, in and around Dublin, and in County Wexford. Some English plays were also performed overseas in Newfoundland, Canada, in St.Kitts-Nevis in the Caribbean, and a few in New England. A small group of scripts collected in Kentucky are problematic and warrant further research. Click on the map to view it full-sized. 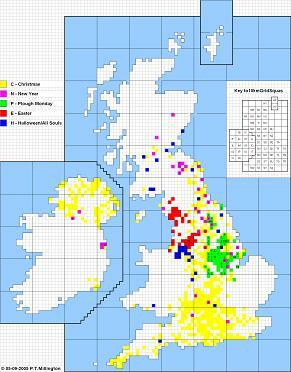 The map above also shows the time of year that folk plays were traditionally. It is worth stating the obvious point that plays were always performed at a particular season and not throughout the year. Although nominally performed on a particular day, in fact most groups performed over a number of days beforehand. Overall, most plays were performed at Christmastide - perhaps until New Year, with Boxing Day (26th December) being the main date for some English groups. However, there were regional variations. In parts of Scotland and northern England, New Year or Hogmanay was the preferred date. In much of the English East Midlands and parts of Yorkshire, the plays were performed on Plough Monday - the first Monday after Twelfth Night or the Second Monday in January (which are usually, but not always the same day). In Lancashire, Cumbria and the Calder Valley of West Yorkshire, Pace Egging plays were performed at Easter, and similar plays were performed in Cheshire by Soulers between Halloween and All Soul's Day. Halloween is also the preferred day in parts of Scotland. There are a few apparently one-off dates at other times that occur here and there; they perhaps deserve further research. Saint George's Day was not a traditional date for folk plays, which is perhaps surprising given that England's patron saint frequently appears as a hero. British and Irish folk plays are usually best performed in the round, whether performed indoors or in the open air. When surrounded by the audience and in close proximity to them, it is easier to interact with them, and this usually improves the performance. Folk plays are occasionally performed on a stage, but the separation from the audience tends to produce a tame result. British and Irish folk plays groups do not normally have a separate director. In fact most groups would probably laugh at the very idea. Everyone who acts in the play is nominally equal. However, they may have a leader, whose role is analogous to a sports team captain. This is underlined by the fact that they often refer to themselves as a 'side' or a 'team', and only rarely as a 'troupe' or 'company' of actors. The leader is more of an organiser or producer than a director, although it may be the leader who assigns parts to the actors. 'Direction' tends to be a collaborative effort among the actors. During practices, or possibly even during a performance tour, they will share suggestions and modify the performance accordingly. The leader may step in to arbitrate if people cannot agree. There are no rules about how folk plays should be performed, and therefore a wide variety of styles may be encountered. There are some groups who perform their plays very seriously, either because they wish to replicate how they feel the plays were originally performed in the distant past, or because they feel the plays have mystical significance and therefore need to be performed straight with almost religious reverence. Such styles of performance may find an appreciative audience among people of a similar persuasion, but they tend to disappoint the general public. A comic, often brash, approach is more common, and this style is usually much more popular. The words tend to be spoken in a declamatory style rather than with any attempt at characterisation or realism. Emotions - mostly anger, surprise and shock - are often overacted for comic effect. The declamatory style is particularly necessary if you are performing in outdoor venues because sound disperses quickly and otherwise your audience may not be able to hear you. It may also be important in noisy indoor venues. From the performance perspective, mumming and guising plays have three main parts - the introduction, the main action, and the conclusion (which academics often call the quête). Or to put it even more simply, a beginning, a middle, and an end. The beginning and end are more significant for folk drama compared with stage plays. In the theatre, the beginning of a play is usually heralded by the dimming of the auditorium lights and the opening of the curtain. Similarly, the end is signalled by the closing of the curtain and the raising of the auditorium lights. This is not possible when performing in the round, so alternative approaches are necessary. Taking the first the beginning, an important function of the introduction is to establish a performance space. If there is not already room, space is normally cleared during the play's introduction. This might be done explicitly by the first character asking for room - 'Room, room brave gallants. Give us room to sport' - while ushering the audience back, perhaps using a broom to clear people out of the way (and clean the ground for the fallen victim). In the cases where all the actors enter together at the start of the play, they may walk around in a circle, expanding the diameter of their circle until they have established their performance space, possibly singing at the same time. In either case, the first character's speech gives the audience time to settle down. Being the first character can require a degree of nerve, especially if the actors enter a house one at a time. In many places, it was the custom to enter without first knocking, and if they were not welcome, they might be chased out of the house, perhaps with a red-hot poker. Conversely, they might also walk in on an intimate scene that warranted a diplomatic retreat. This custom therefore required an extra level of confidence, and consequently, the first actor was often also the leader of the group. First, a bit of practical advice; when actors have finished their parts, they need to make sure they are not obstructing the view of the audience to the rest of the play. Often, actors will form a line or semicircle at the back of the performance space, and they will step in and out of the line as required. Even forming a circle round the performing area may work, as with the famous Marshfield Mummers, provided there is plenty of space between the actors for people to be able to see the play. In busy pubs, however, it may be difficult to do any of these, so it may be necessary to leave the room at the end of the part, or to retire to any space that is out of the way until the end of the play. And there's really not very much more. One reason for the lack of plot is that the plays are usually very short - typically of 10 to 15 minutes duration - which does leave much room for the development of a story. Another point of view is that the plays are primarily a sequence of independent personages and stereotypes, saying their piece, with the dialogue merely serving to link them together. There is some evidence to support this idea. In many plays, most lines are spoken by the character that most recently entered, or where there is dialogue, it is spoken between the two most recent characters. This approach has been taken to its extreme in the modern plays of the Wexford Mummers, where there is virtually no dialogue. If you agree with this interpretation, then you might wish to concentrate more on building up the individual characters rather than working on the interplay between them, or to treat the play as a series of vignettes. This may be particularly appropriate for Recruiting Sergeant plays. Yet another point of view is that the key character is the Doctor, and that the main purpose of the foregoing action it to provide him with a patient to revive. Certainly, the Doctor appears to be the one universal character in all the versions of these plays, with a varied menu of heroes and enemies available for the dispute that leads up to one of them being knocked to the ground. In the hero-combat plays, much play can be made of the sword fight, and the braggadocio that precedes it. There is an opportunity here to get the audience to take sides and cheer on the disputant they favour, and to boo their enemy, with more cheers and boos when one is victorious. After the fight, it is common for someone to mourn the loss of their loved one, and often this character is a woman - or more usually a man dressed as a woman. Such characters present another opportunity for humour. There seem to be two approaches. The first is to make the man appear as feminine as possible. I have seen wives and girlfriends set to work avidly on dressing and making up the most macho man in the group, metamorphosing him into a very convincing woman. Alternatively, characterisation may go the other way, portraying the woman as a pantomime dame - a grotesque parody of a woman, often played by a man with a full beard. Recently, there has also been a trend to emulate the 'ladies' from the 'Little Britain' television show. It remains to be seen how long-lasting this will be. Whichever portrayal is chosen, there is plenty of scope for comic interaction between the man-woman and the audience, perhaps flirting with the men or comparing female attributes with the women. At has to be said, however, that the Doctor probably provides the best opportunities for humour. The classic portrayal is of the old-style Harley Street doctor in morning coat and top hat, but recently there has been much more variation - a hospital doctor in a lab coat, an Australian flying doctor, Dr. Who, and so forth - possibly even a PhD. However, whichever approach is used, he is usually acted as a quack doctor (although those following the 'mystical' route may portray him more as a wizard). To make the most of this part, the doctor often needs to be the best actor in the group. The doctor is typically asked about his travels and his cures, makes a diagnosis, and of course performs the cure. Sticking to the script may be funny enough, but topical ad libs and improvisation may add to the humour. For instance, the Doctor usually carries his doctor's bag, and any number of strange objects and contraptions may be brought out of it to amuse the audience. The main action of most mummers' and guisers' plays finishes when the Doctor has performed his cure, but many plays do not end immediately. Instead, the conclusion is drawn out by the entry of one or more extra characters, which academics often refer to as supernumeraries. They normally have little or nothing to do with the preceding action, but their usual role is to ask for money or hospitality from the audience. This also happens with plays that are not Quack Doctor plays. There are many different extra characters and they vary from region to region. Northern England and Ulster, for instance, have Beelzebub and Little Devil Doubt, who have the potential to try and scare the audience. In southern England, but also elsewhere, the supernumeraries may represent deserving people in need of a reward, notably Little Johnn Jack, with his wife and family at his back. In a long standing group, it is quite common for the newer members to start out with one of these cameo parts. They only have a few lines to learn at first, and then as they take part in more performances they gradually pick up the rest of the play. Playing these parts can therefore be rather like serving an apprenticeship. Any musicians with the group may also be given these parts in order to bring them into the performance. As they are not meant to be actors, it is appropriate that they only have few lines to learn. This nicely brings us to the actual end of the play. Almost any of the extra characters' requests for money and hospitality can be the final speech of the plays, but with no stage curtain to close, something more is required. As with stage practice, there is tendency for all the actors to line up and bow while (hopefully) the audience applauds. However, in a lot of cases, the group sing a final song. This may simply be a popular Christmas carol, but in some cases there is a special song - such as with Pace-Egging plays and Plough Monday plays. This very clearly signals the end of the play. The requests of the extra characters during the conclusion are fine if you intend to make a collection. (Many folk play groups nowadays collect money for charities.) However, there may be contexts where this is not appropriate - for instance, a performance spot at an event where people have paid for entry. This can be a tricky situation, and it is difficult to give any specific advice, because each case needs to be considered individually. It is something you need to think about before you perform.